We were at a funeral recently and as the people were leaving and passing by the open casket a lady ahead of us stopped and began “speaking in tongues." After concluding she began “interpreting” what she had just “said." Part of what she said caught my attention for she informed us that this lady was in heaven. For those who do not understand what the Bible has to say about what happens to a person when they die, please see our study on the State of the Dead by clicking on the shaded area. Was this lady, lying in the casket, in heaven? While most people in the world accept the belief that when you die you go to heaven or you go to hell, the Bible tells us a very different story. “To the law and to the testimony: if they speak not according to this word, it is because there is no light in them” (Isaiah 8:20). If what people say does not line up with what the Bible has to say on a matter, what are we to do? “Beloved, believe not every spirit, but try the spirits whether they are of Elohim: because many false prophets are gone out into the world (1 John 4:1, 2, emphasis added). We are to hold up the teachings and sayings of men to the light of the Word of Elohim in order to “try” or test them to see “whether they are of Elohim” or of the devil! And if “they speak not according to this word [of Elohim] there is NO light in them”. When the woman who “spoke in tongues” said that this woman, lying in the casket, was in heaven, bells and whistles went off in my mind. Why? She was not speaking “according to this word [of Elohim]” which clearly teaches that when people die they are asleep in the grave until Yahushua returns to awaken them. I will cite two portions of scripture to show you what the Bible says over and over again on this matter. Is King David in heaven? On the day of Pentecost when the disciples were filled with the Spirit of Elohim Peter said this: “Men and brethren, let me freely speak unto you of the patriarch David, that he is both dead and buried, and his sepulcher is with us unto this day . . . For David is NOT ascended into the heavens” (Acts 2:29, 34, emphasis added). “So David slept with his fathers, and was buried in the city of David” (1 Kings 2:10). The Bible tells us when one dies he lies in the grave as though he were asleep, to be awakened by Yahushua when He returns. “Behold, I shew you a mystery; We shall not all sleep [Some will remain alive until Yahushua returns. ], but we shall all be changed, in a moment, in the twinkling of an eye, at the last trump: for the trumpet shall sound, and the dead [in Messiah] shall be raised incorruptible, and we shall be changed” (1 Corinthians 15: 51, 52). So the question begs to be asked; was this woman mistaken or was the spirit that moved her to “speak in tongues” misleading those who heard. It is my understanding, and you may correct me if I am wrong, but those who “speak in tongues” and “interpret” are said to be moved upon by what they consider the Spirit of Elohim, and what they say is supposedly from Elohim. If this is not so, then the spirit that moved upon this woman was not the Spirit of Elohim. If we put that spirit to the test as to whether what was said was according to the Word of Elohim, we find it not in harmony with what the Word tells us. Elohim does not contradict Himself! If throughout His Word, we are told one thing concerning the state of the dead, and then a spirit speaking through an individual contradicts what the Word of Elohim says, we can only come to one conclusion; that it was not the Spirit of Elohim which spoke through that woman that day, unless we do not accept the Bible as the standard by which all matters are to be tested. So is there a gift of “speaking in tongues?" Yes there is, but we must remember that the Devil is deceiving the whole world (Revelation 12:9). He is not just deceiving a few here and a few there, but the whole world. He is not deceiving everyone in the same manner. He has a multitude of methods by which he is accomplishing his purpose. Some of his methods are so obvious to some of us, that we quickly turn away from them, while others readily fall for his devices. We are told that “if it were possible, even the elect” would be seduced (Mark 13:22). And by what methods will he use to seduce even the very elect? “For false Messiahs and false prophets shall arise, and shall show signs and wonders, to seduce, if it were possible, even the very elect” (Mark 13:22, emphasis added).). Does the devil have the ability to give his agents the means to “show signs and wonders?" The first incident shown in the Bible of Satan’s capabilities was seen in the garden of Eden when he spoke through the serpent to tempt Eve (Genesis 3:1-6). It was not until after the serpent had been used by Satan that the serpent was made to crawl on his belly (Genesis 3:14). We will see that Satan uses many means to deceive people. We read in the book of Job what Satan did when he was given permission by Elohim to bring troubles upon Job. Satan moved upon the Sabeans to steal Job’s cattle and slay Job’s servants (Job 1:14, 15, 17). Satan brought fire down from heaven and burned up Job’s sheep and his servants (Job 1:16). And Satan caused a “a great wind” to come and blow down the house where Job’s children were, killing them all (Job 1:13, 19, 20). Today when calamities occur in nature happen, Who is it that gets credited with them? Elohim gets the blame, just as He did when the “fire of Elohim is fallen from heaven” (Job 1:16), even though we know that it was Satan doing this. We must be aware of what the Bible has to say about Satan and his powers. How is Satan deceiving the whole world (Revelation 12:9)? “And he [Satan] doeth great wonders, so that he maketh fire come down from heaven in the sight of men, and he deceiveth them that dwell on the earth by the means of those miracles which he had power to do” (Revelation 13: 13-14, emphasis added). Satan has the ability to perform miracles. When Moses went in before Pharoah of Egypt, he showed Pharoah signs that Elohim had given him to do before Pharoah in order to convince Pharoah that he should let the descendants of Israel leave Egypt. Instead of letting them go Paroah called in his magicians who performed similar acts thus causing him to harden his heart. While the magicians were able to copy some of the miracles performed through Moses, they could not copy all of them. Satan was using those magicians to perform those acts. Read Exodus chapters 7 and 8. The early Christian Church was not ignorant of Satan and his devices and why is it so important to know what he could do if he is given permission by Elohim. “Lest Satan should get an advantage of us: for we are not ignorant of his devices” (2 Corinthians 2:11, emphasis added). In the world, and even within the Christian Community, there is a growing unbelief that such a being as Satan even exists. What “advantage” do you think that gives to Satan? Here is one advantage that I see, but there are many. If we do not believe there is a being called Satan, then to whom do we attribute the “signs and wonders” when they appear in our midst? Elohim? Even though they may done by Satan. I believe we have a most malicious, evil, deceptive and sadistic foe to contend with in this world we live in. We have been given ample warning of him, but few make the Bible their study and their supreme authoritative source on which to base their belief system. So many would rather base their Bibles studies out of a book written by some man rather than the pure word of Elohim. Satan is so deceptive that he deceived one-third of the angels of heaven right in the very presence of Elohim and took them with him when he cast out of heaven to this earth. He was not cast out into a place called hell. He was cast out to this earth. “And there was war in heaven: Michael and his angels fought against the dragon; and the dragon fought and his angels, and prevailed not; neither was their place found any more in heaven. And the great dragon was cast out, that old serpent, called the Devil, and Satan, which deceiveth the whole world: he was cast into the earth, and his angels were cast out with him” (Revelation 12:7-9, emphasis added). “And his tail drew the third part of the stars of heaven, and did cast them to the earth” (Revelation 12:4, emphasis added). See Revelation 1:20 where stars are used in reference to angels. When there are wars in this earth among men, the opposing generals read and study all the materials available on their opponents. They want to know as much as they can about their opponent. So it “must be” with us. The Bible gives us a wealth of material to understand Satan’s methods and means of deception, and we remain ignorant of his devices at our own peril! The Devil cannot originate anything. He is the great counterfeiter. As with any counterfeiter, he only counterfeits the real deal and yet there are always flaws in the counterfeit by which it differs and can be known from the real. A counterfeiter will not counterfeit a three dollar bill, will he? Neither will Satan counterfeit something that does not exist in Elohim’s kingdom. He counterfeited what Elohim had done with Elijah, when fire came down from heaven to consume Elijah’s offering. Satan brought fire down from heaven when he burnt up Job’s sheep and servants and the credit (blame) was given to Elohim. “The fire of Elohim is fallen from heaven” (Job 1:16). But we know that it was Satan who did this. In the final days of earth’s history before the return of Yahushua, Satan will again bring fire down from heaven to deceive men (Revelation 13:13). And today we have one of Satan’s most successful counterfeits in the so-called “speaking in tongues." Make no mistake in thinking that I do not believe in “all” the gifts of the Spirit of Elohim, which includes the “discerning of spirits” (1 Corinthians 12:10). In my opening remarks I referred to 1 John 4:1. “Beloved, believe not every spirit, but try [test] the spirits whether they are of Elohim” (emphasis added). If they are not “of Elohim," then who would they be of? Just because something is proclaimed to be of Elohim does not make it so. It must stand up to the careful scrutiny of being compared to what the Bible has to say on any given matter. We have all been deceived by Satan at one time or another. He is the master deceiver who has perfected his skills over the last 6,000 years. If we say we have not been deceived or maybe even say that we have never been deceived, it may be that “the god of this world hath blinded” our minds (2 Corinthians 4:4), and we are greatly deceived. There has been no one except for Yahushua, to my understanding, who has never been deceived by Satan. But to remain loyal to that deception whatever it may be is perilous. It is the truth that sets us free from the deceptions of Satan. “And you shall know the truth, and the truth shall make you free [free from Satan’s deceptions]” (John 8:32). These are the gifts of the Spirit of Elohim as listed in the Bible. “Now there are diversities of gifts, but the same Spirit. And there are varieties of ministries, and the same Master. There are varieties of effects, but the same Elohim who works all things in all persons. But to each one is given the manifestation of the Spirit for the common good. For to one is given the word of wisdom; to another the word of knowledge by the same Spirit; to another faith by the same Spirit; to another the gifts of healing by the same Spirit; to another the working of miracles; to another prophecy; to another discerning of spirits; to another divers kinds of tongues [languages]; to another the interpretation of tongues: but all these worketh that one and the selfsame Spirit, dividing to every man severally as He will” (1 Corinthians 12:4-11 NAS, emphasis added). “And Elohim hath set some in the church, first apostles, secondarily prophets, thirdly teachers, and after that miracles, then gifts of healings, helps, governments, diversities of tongues [languages]. Are all apostles? Are all prophets? Are all teachers? Are all workers of miracles? Have all the gifts of healing? Do all speak with tongues [languages]? Do all interpret? But covet earnestly the best gifts” (1Corinthians 12:28-31). Not everyone has the same gifts, but in the movement of "speaking in tongues" everyone speaks in tongues which is not Biblical. “Follow after charity, desire spiritual gifts, but rather that you may prophesy” (1 Corinthians 14:1). There are a number of gifts given by the Spirit of Elohim to individuals, but is there any mention of one gift being given to every individual? “All these are the work of the one and the same Spirit, and He gives them to each one, just as He determines” (1 Corinthians 12:11, emphasis added). “As He determines," not as we determine. Paul goes on in 1 Corinthians 12 comparing the gifts of the Spirit of Elohim to the parts of the human body. The body is composed of many parts, but they all contribute to the function of the body. See 1 Corinthians 12:14-17. Just as there are different body parts so there are different gifts that are given to the church by Elohim. All do not receive the same gift and every gift is of importance to the ultimate success of our commission to carry the gospel and the truths contained in the Bible into all the world. In 1 Corinthians 12:29-30, Paul asks a series of questions. “Are all apostles? Are all prophets? Are all teachers? Are all workers of miracles? Have all the gifts of healing? Do all speak with tongues [languages]? Do all interpret?” And the resounding answer to each and every question is NO! Including “do all speak with tongues [languages]?" Many consider it an evidence that one has the Spirit of Elohim if you can speak in a “unknown tongue." It should be noted that whenever the word “unknown” is used in 1 Corinthians 14, it is italicized which means that word is supplied by the translators and is not contained in the original text. But as Paul clearly points out not all receive the same gift. But yet people are judged by whether they can speak in “unknown tongue” as to the whether they have the Spirit of Elohim. The Spirit of Elohim gives His gifts as He decides on an individual basis based on a need. We have no evidence from the Bible that the Spirit of Elohim gives everyone the same gift. In fact, just the opposite is found to be true. There is a diversity of gifts that should be seen when the Spirit of Elohim is working in the midst of Elohim’s people. The gift of “speaking in tongues [languages]” is towards the bottom of the list of gifts given by the Spirit of Elohim. How can one tell whether you have the Spirit of Elohim abiding in you? “But the fruit [the evidence that the Spirit of Elohim is in you] of the Spirit is love, joy, peace, longsuffering, gentleness, meekness, temperance: against such there is no law” (Galatians 5:22, 23). If these are missing, can we not question whether or not a person has the Spirit of Elohim? Also in John 16:13, Yahushua said that the Holy Spirit of Elohim is given for two specific purposes. “Howbeit when He, the Spirit of truth (Spirit of Elohim), is come, He will guide you into all truth: for He shall not speak of Himself; but whatsoever He shall hear, that shall He speak: and He will show you things to come” (John 16:13, emphasis added). So with all that has been said about “speaking in tongues," is what we are seeing in the churches today the genuine “divers kind of tongues [languages]?" Some would consider it “blasphemy” to even ask such a question. But we are to try (test) the spirits. The “truth” can afford to be inspected and does not fear the results. It is “error” that keeps people from questioning and cannot stand up to the scrutiny of being compared with what the Word of Elohim has to say. The Greek word translated into “tongues” is “glossa." This Greek word also could have been translated into “languages." Strong’s Concordance tells us that it is “a language not naturally acquired." One does not have to go through months or years of schooling to obtain this ability. It is a gift bestowed on an individual in order to supply a need. And that need is to communicate the gospel and the truths contained in the Word of Elohim to the entire world. There is also a Greek word called “glossolalia” which more accurately describes the popular experience found in the charismatic churches. It is defined in the American Heritage Dictionary as: “fabricated and non-meaningful speech, especially associated with a trance state or certain schizophrenic syndromes." This is in contrast with the same dictionary’s definition for a “language:" “the use by human beings of voice sounds, and often written symbols representing these sounds, in organized combinations and patterns in order to express and communicate thoughts and feelings”. In Acts 2:1-11, we have the account of what took place on the day of Pentecost and from which a movement has taken on the name of the “Pentecostal Movement." 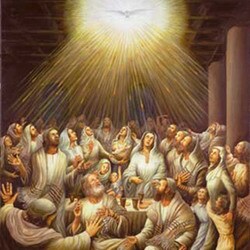 “And when the day of Pentecost was fully come, they were all with one accord in one place. And suddenly there came a sound from heaven as of a mighty rushing wind, and it filled all the house where they were sitting. And there appeared unto them cloven tongues like as of fire, and it sat upon each of them. And they were all filled with the Holy Ghost [Spirit], and began to speak with other tongues [languages], as the Spirit gave them utterance. And there were dwelling at Jerusalem Jews, devout men, out of every nation under heaven. Now when this was noised abroad, the multitude came together, and were confounded, because that every man heard them speak in his own language. And they were all amazed and marveled, saying one to another, Behold, are not all these which speak [not babble] Galileans? And how hear we every man in our own language, wherein we were born? Parthians, and Medes, and Elamites, and the dwellers in Mesopotamia, and in Judea, and Cappadocia, in Pontus, and Asia, Phrygia and Pamphylia, in Egypt, and in the parts of Libya about Cyrene, and strangers of Rome, Jews and proselytes, Cretes and Arabians, we do hear them speak in our tongues [languages] the wonderful works of Elohim” (emphasis added). Were John the Baptist, John’s mother, Elizabeth, and John’s father, Zacharias, filled with the Holy Ghost? Was Yahuhsua filled with the Holy Ghost? John the Baptist was filled with the Holy Ghost even while he was in his mother’s womb (Luke 1:15). “Elizabeth [John the Baptist’s mother] was filed with the Holy Ghost” (Luke 1:41). She was moved to utter those profound words found in Luke 1:42-55 and not in some “unknown language." “And his [John the Baptist’s] father Zacharias was filled with the Holy Ghost, and prophesied, saying, Blessed be Yahuwah Elohim of Israel; for He hath visited and redeemed His people, and hath raised up an horn of salvation for us in the house of His servant David; as He spoke by the mouth of His holy prophets, which have been since the world began: that we should be saved from our enemies, and from the hand of all that hate us; to perform the mercy promised to our fathers, and to remember His holy covenant; the oath which He sware to our father Abraham, that He would grant unto us, that we being delivered out of the hand of our enemies might serve Him without fear, in holiness and righteousness before Him, all the days of our life, and thou, child, shalt be called the prophet of the Highest: for thou shalt go before the face of Yahuwah to prepare His ways; to give knowledge of salvation unto His people by the remission of sins, through the tender mercy of our Elohim: whereby the dayspring from on high hath visited us, to give light to them that sit in darkness, and in the shadow of death, to guide our feet into the way of peace” (Luke 1:67-79). Again we find here someone who was “filled with Holy Ghost” speaking words easy to be understood and not in some “unknown tongue” that cannot be understood unless someone interprets it. Why were those who were “filled with the Holy Ghost” given the ability to speak other tongues (languages) on the day of Pentecost? Because the audience to which the apostles and disciples were speaking to were “devout men, out of every nation." “Every man heard them [apostles and disciples] speak in his own language” (Acts 2:6). There is no mention of any interpreting being done in order for this to be accomplished. The people were “confounded” and “they were all amazed and marveled” because that these men were for the most part uneducated “Galileans” and asked the question “And how hear we every man in our own tongue [language] wherein we were born?” (Acts 2:7-8). What was being said did not need to be interpreted. The people we are told were from many different countries (Acts 2:9-11). And they remarked “we do hear them speak in our tongues [not some unknown tongues or languages] the wonderful works of Elohim” (Acts 2:11). The apostles and disciples were given “glossa” which we discovered earlier means the ability to speak “a language not naturally acquired." They were known languages and not unknown languages, and they were given the ability to speak so that the people could understand in their own tongue (language) the message that was given by the apostles and disciples. It was not “glossolalia” or “a fabricated and non-meaningful speech” which was displayed that day on Pentecost and which would have had to be interpreted in order for the people to understand what was being spoken. Was Yahushua “filled with the Holy Ghost?" Yet we never once read where He spoke in an unknown language, do we? There are more than 50 instances given in the Scriptures where individuals are said to be “filled with the Spirit of Elohim," and when we examine closely what is written in the Bible we find nothing in the Bible with which to sustain the concept that it is an unknown language being spoken. “While in a trance the Pythia ‘raved’ – probably a form of ecstatic speech – and her ravings were ‘translated’ by the priests of the temple into elegant hexameters.” Wikipedia. under the entry Delphi. The Pentecostal Movement also known as the Charismatic Movement is the international trend of historically mainstream congregations adopting beliefs and practices similar to Pentecostals. Fundamental to the movement is the use of spiritual gifts. Among Protestants, the movement began around 1960. Among Roman Catholics, it originated around 1967 and has its roots in the pagan practices of the ancient Greeks. This is Satan’s Trojan horse bringing pagan style worship into the Christian churches with a frightening degree of success. Satan wants to shift the attention of the Christians from “faith” to “feelings." Some of these Charismatic churches go so far as to say that the Bible is the old letter, and that messages which come through tongues are fresh revelations of the Spirit and therefore are more dependable, thus doing away with the Bible as the detector of error. But “if they speak not according to the law and to the testimony, it is because there is no light in them” (Isaiah 8:20, emphasis added). I believe the purpose of what we are seeing is to remove the “Detector of Error”, the Bible, so Satan may bring in his deceptions more fully to bear upon the people. “And the great dragon was cast out, that old serpent, called the Devil, and Satan, which deceiveth the whole world” (Revelation 12:9, emphasis added). I recently shared my study on the state of the dead with a Pentecostal minister, who, after reading it said to me “What difference does it make?" The truth sets us free from Satan’s deceptions folks. If you believe that your departed loved one went to heaven in a spirit form, what will you do when you are confronted by someone claiming to be that departed loved one? Do you understand what Spiritualism is all about? It is built on the lie first told Eve in the Garden of Eden by Satan that “you will not surely die” which was in direct contradiction from what Elohim had said. And just as Satan contradicted Elohim in the beginning so he is once again contradicting what the Word of Elohim tells us. I attended a Charismatic Church for a while so I know from first-hand experience what goes on there. On Mt. Carmel, we have the story of the 400 pagan priests of Baal in a contest with Elijah, the lone prophet of Elohim. In order to get Baal’s attention the pagan prophets jumped on the altar and shouted and yelled to Baal and cut themselves. In stark contrast, Elijah knelt down quietly and prayed a simple pray of faith (1 Kings 18:17-46). When Yahushua healed people and cast out the demons, He very simply spoke to the one affected and that individual was healed, quite unlike what is seen in Pentecostal churches. “For Elohim is not the author of confusion” (1 Corinthians 4:33). Who is the author of confusion, if “Elohim is not”? Satan! The idea that we lose control when we receive the Spirit of Elohim is not consistent with the Scriptures. Having grown up in the Catholic Church in the 50’s and 60’s when Latin was used for the Mass reminds me of what is taking place in the Charismatic Movement. What are you saying you may ask? Does the message given reach the understanding so you can make intelligent decisions? Elohim says “Let us reason together” (Isaiah 1:18, emphasis added). It is all based on emotion and feelings in the Charismatic Movement. When the Devil was cast out of the demon-possessed man, he was seen “sitting at the feet of Yahushua, clothed, and in his right mind” (Luke 8:35). He was not all emotional over what had happened to him. Elohim gave us a brain to use; to reason with. There is a true gift of tongues or languages which I believe is desirable to have. It is not high on the list as given in 1 Corinthians 12. But when there are barriers of languages which prevent the proclamation of the truths of Elohim's Word, that gift is given. I do not believe Elohim gives out gifts that are not needed, but they are given for the purpose of making His truths known into all the world; “to every nation, and kindred, and tongue and people” (Revelation 14:6). Would there be any need to give the gift of tongues (languages) to someone living among people who all spoke the same language in order to communicate the truths of the Word of Elohim? The word “babbling” as seen in the Charismatic Movement comes from the story of ancient Babylon. At Pentecost, as recorded in the second chapter of Acts, the curse was reversed so others might understand the gospel in their own native language. Is the Holy Ghost (Spirit of Elohim) given to just anyone? Yahushua said, “If you love Me, keep My commandments. And I will pray the Father, and He shall give you another Comforter, that He may abide with you forever; even the Spirit of truth” (John 14:15-17). “And we are His witnesses of these things; and so is also the Holy Ghost (Spirit of Elohim), whom Elohim hath given to them that obey Him” (Acts 5:32, emphasis added). We have seen over the years TV evangelists who fell by the way. Many of them claimed to be filled with the Holy Spirit and have the gift of tongues, but they were living in gross immoral disobedience. And when they went overseas why did they need an army of interpreters to translate for them if they had the gift of tongues? Paul tells us that he spoke in more tongues (languages) than anyone else (1 Corinthians 14:18). I am taking that to mean he spoke in many languages as needed in his travels. And then he goes on to say, “Yet in the church I had rather speak five words with my understanding, that by my voice I might teach others also, than ten thousand words in an unknown tongue [language]” (1 Corinthians 14:19, emphasis added). “In understanding be men” (1 Corinthians 14:20). How can one be a man "in understanding" if you do not know what is being said? Just like in the Catholic Church when Latin was being used. Why does Elohim give the Spirit? “But you shall receive power, after that the Holy Ghost is come upon you: and ye shall be witnesses unto Me” (Acts 1:8). Elohim does not give us His Spirit to babble, but as a powerful means for witnessing! And prior to receiving the power of the Spirit of Elohim for witnessing, it is given to us for cleansing us and transforming us into Elohim's likeness. "But we all, with open face beholding as in a glass the glory of Yahuwah, are changed into the same image from glory to glory, even as by the Spirit of Yahuwah" (2 Corinthians 3:18). How can we receive the genuine gift of the Holy Spirit of Elohim? When we are in obedience to Him (Acts 5:32), we simply need to ask. “If you then, being evil, know how to give good gifts unto your children: how much more shall your heavenly Father give the Holy Spirit to them that ask Him?” (Luke 11:13). It is up to the Spirit of Elohim to determine which gifts, if any, you are in need of to accomplish the commission given to you as a follower of Messiah. But one thing we are all in need of and that is the truth which sets us free from the deceptions of Satan and can only be attained as we are taught by the Spirit of Elohim (John 16:13). Elohim has promised to give us His Spirit to guide us into all the truth! The Pentecostal minister to whom I gave the study of the State of the Dead replied to me upon finishing reading it “what difference does it make?" “What difference does it make?” If we do not have the truth on a matter then Satan is deceiving us, and we are being led astray. And if we are being led astray, we will not have a home on this earth when it is made new! “Study to show thyself approved unto Elohim, a workman that needeth not to be ashamed, rightly dividing the word of truth” (2 Timothy 2:15). "Elohim hath from the beginning chosen you to salvation through sanctification of Spirit [made holy and righteous] and belief of the truth" (2 Thessalonians 2:13). It is vital that we are not being led astray (Revelation 12:9), and only the Spirit of Elohim can guide us into all the truth (John 16:13).